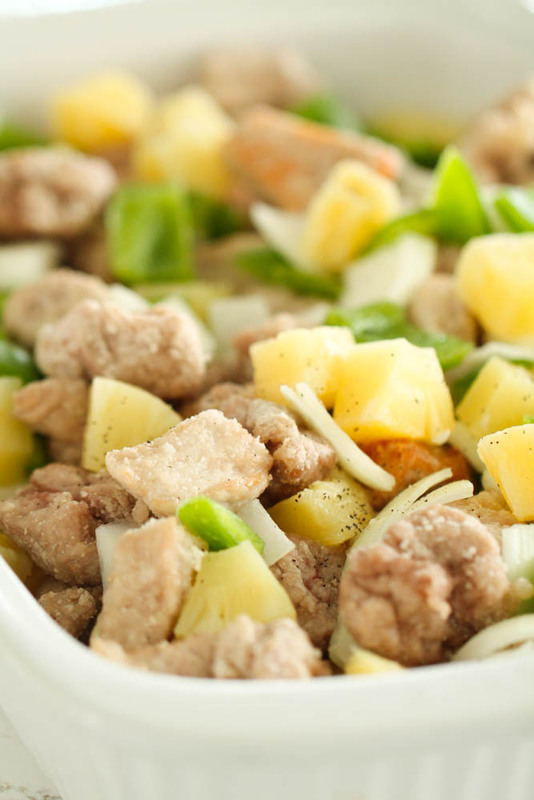 Crisp and juicy pork with green peppers, onion and pineapple tossed in a sweet and tangy sauce. I have always been a huge Chinese food person. There are few things I love more than a night at home with some take-out in sweat pants while watching a movie. I sound really exciting, don’t I? Haha sometimes it is just easier to make take-out at home then toting 4 little ones to a restaurant with me! One of my all time favorite recipes on our blog is our Baked Sweet and Sour Chicken. I actually prefer our recipe to restaurant take-out because I know exactly what ingredients are going into it and I don’t feel sick after eating it like I do when I eat traditional fried take-out. 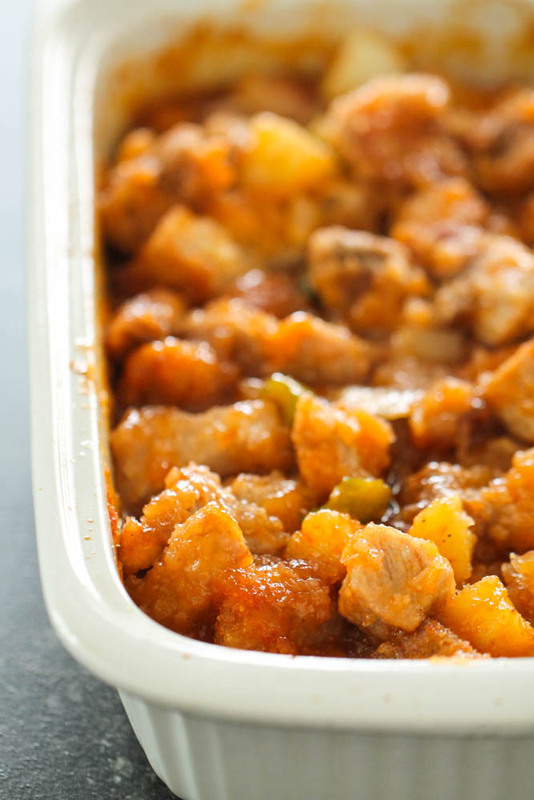 I love fried food, but I hate the mess it makes so I tried to simplify this recipe as much as possible to make this the easiest baked sweet and sour pork of all time. 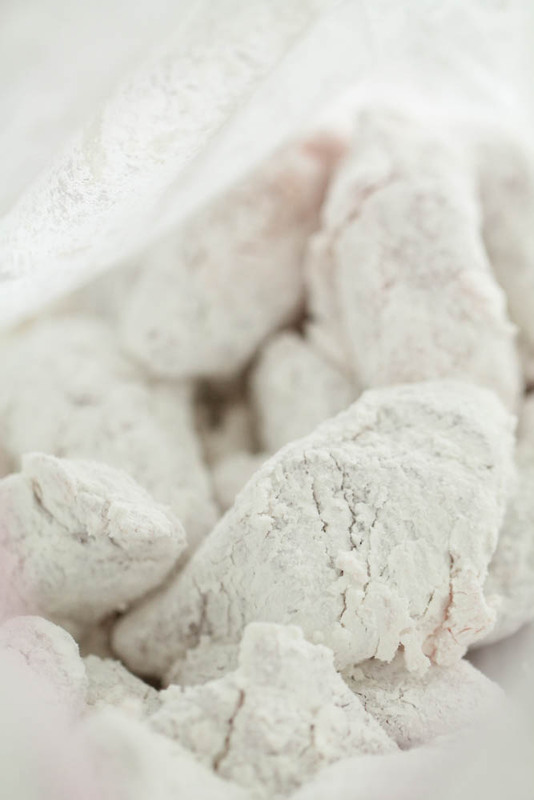 Typically when I make battered food at home, I dip it in an egg wash, followed by a cornstarch/flour mixture before frying. It is seriously a disaster. My fingers are covered and sticky and I absolutely hate touching raw meat. For this recipe, I cut my pork loin roast into 1-inch pieces and placed them in a gallon Ziploc bag. Rather than dipping the pork multiple times in an egg wash/dry ingredient mixture, I just poured my cornstarch directly over the pork, sealed the bag and shook it until all the pork was covered. This doesn’t give the pork as much of a breading as you would get in a restaurant, but that also means it doesn’t soak up as much of the oil when you fry it, which I like. The best part was that I didn’t have to touch any of the meat with my hands haha! I know this is a recipe for “baked” sweet and sour pork, which it technically is. However, I do like my pork to have a little bit of a crispy outside to seal in all the natural juices. After the pork was covered in cornstarch, I fried it in vegetable oil for just a few minutes so it could form a nice crust on the outside. You will be baking the pork after you fry it, so you don’t need to worry about cooking it all the way through at this point. I love having other flavors and textures with my sweet and sour pork, so I seasoned my pork with salt and pepper then threw in an onion, green bell pepper and some pineapple chunks (be sure to save the juice from your canned pineapple to use in the sauce). If you have picky eaters that don’t love some of these ingredients, you could omit them completely. The sauce with the pork over some rice is still delicious! I made a simple sweet and sour sauce on my stovetop with the pineapple juice leftover from my pineapple chunks, sugar, apple cider vinegar, ketchup, soy sauce and a little garlic salt. I typically don’t add pineapple juice when I make sweet and sour sauce, but after making this recipe, I will never go back! It added just the right amount of sweetness to the sauce. I whisked the ingredients together and brought them to a boil over medium heat to help it thicken up just a little. It will continue to thicken as it bakes. I poured my homemade sweet and sour sauce over my pork, gently mixed it together and put it in the oven for an hour. I made sure to stir everything every 15 minutes or so to keep the pork coated in sauce and so that it wouldn’t burn. 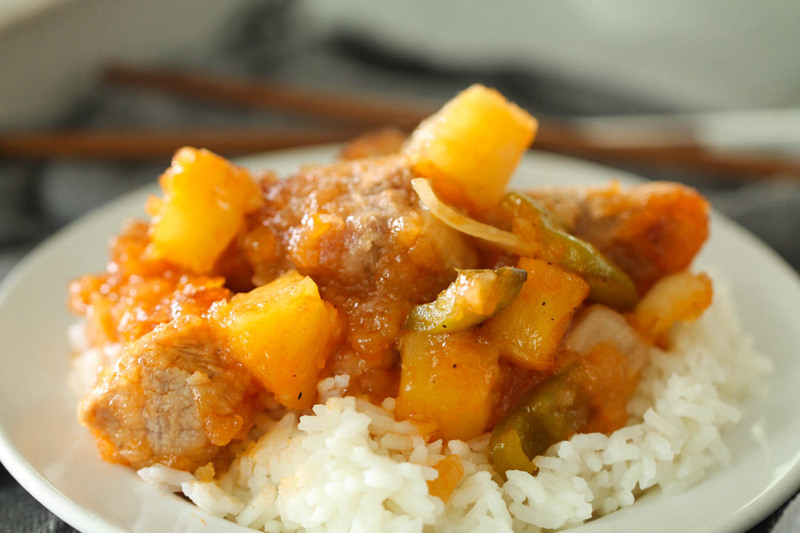 We served our sweet and sour pork over rice and it was the perfect meal. Even though this dish cooks for an hour, it is really simple to throw together and our family loved it! I loved that it wasn’t a really heavy dish because of the light breading on the pork and the flavor of the sweet and sour sauce was spot on. 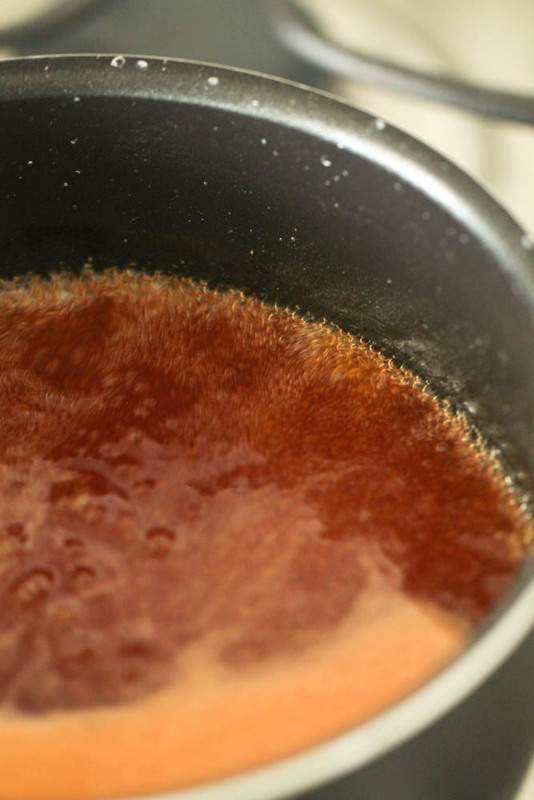 Heat vegetable oil in a large pot over medium-high heat. 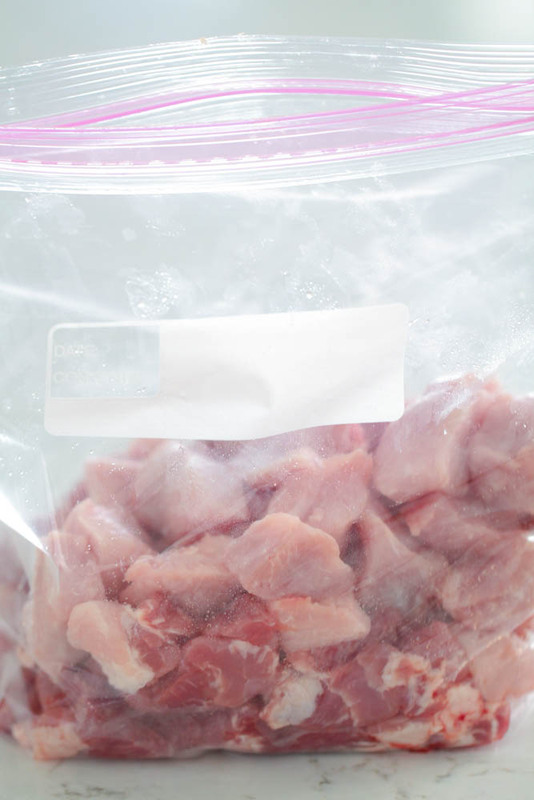 Cut pork roast into 1-inch pieces and place in a gallon sized Ziploc bag. 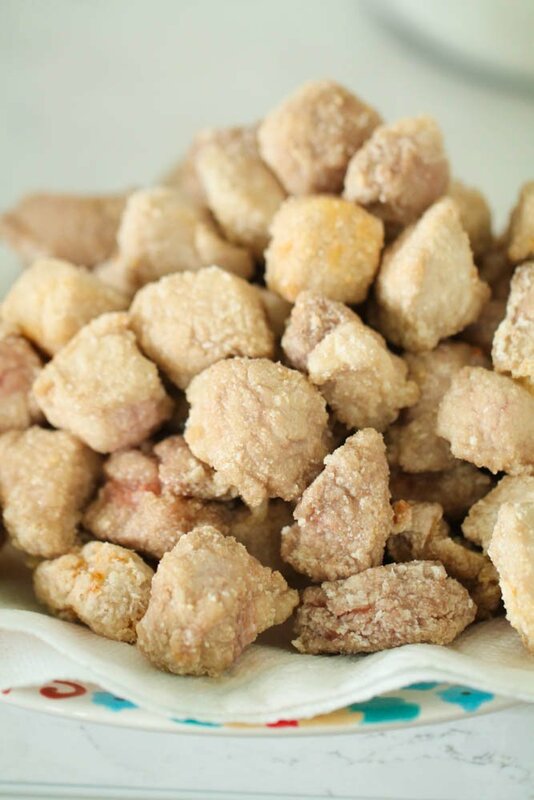 Pour cornstarch into Ziploc bag, zip closed and shake until pork is evenly coated with cornstarch. Carefully add pork a few pieces at a time to hot oil, let cook for 2-3 minutes, remove and place on a plate covered with a paper towel to absorb excess oil. Repeat until all pork has been cooked in oil. Spray a 9x13-inch baking pan with nonstick cooking spray and spread pork in the bottom. Sprinkle on chopped onion, pepper and pineapple chunks. Season with salt and pepper, to taste. Pour pineapple juice from pineapple chunks into a saucepan over medium heat. Whisk in sugar, apple cider vinegar, ketchup, soy sauce and garlic salt. Bring to a boil and pour over the pork, vegetables and pineapple. Gently stir to combine. Place pan in oven for 1 hour, stirring every 15 minutes to continually coat pork in sauce. Remove from oven and serve over rice. If you want to enjoy a full Asian-inspired night at home, eat this Sweet and Sour Pork with our Baked Crab Rangoons, Baked Veggie Egg Rolls and Chicken Fried Rice.